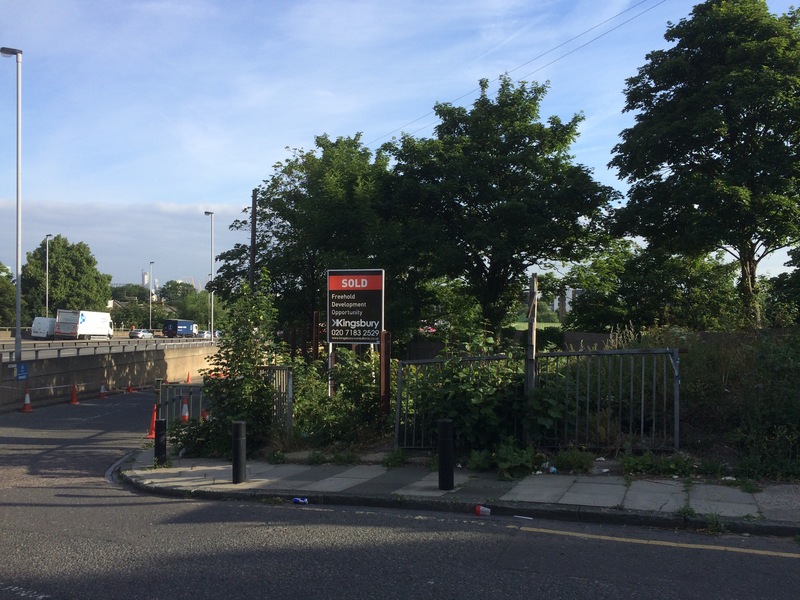 Des res, overlooking the Blackwall Tunnel approach – new flats and office space for Bramshot Avenue? A ‘Sold’ board has gone up on the vacant plot at the western end of Bramshot Avenue. Property developers Kingsbury Consulting show the site as being ‘Sold for development’ on their website, with planning permission for ‘7 apartments and commercial’; the site is bounded by the approach road to the Metropolitan Police car pound, and overlooks the A102. Full details of the planning application – approved back in September 2013 – can be found on the council’s planning website; search for Ref 13/1887/F or ‘Bramshot’. The plans indicate a 4 storey building with 7 flats above a single office space, parking for 9 cars, plus a ‘green roof’. We’ve seen no indication yet as to when building may take place. Not only does it have a view of the A102, but also the Blackheath the Charlton railway line which emerges from the tunnel just to the north of this site, in fact I think the site is directly above the tunnel. This application was subject to appeal, and the Planning Inspectorate found in favour of the appellant on 23 March. What is shocking is para 24 of his report and condition 13 where he says that future occupiers must have an info pack telling them not to open the window because of the air pollution.What kind of a crack-witted decision is this? You couldn’t make this up! I wonder whether there are similar conditions about air polution and non opening windows for the new flats being built at the rear of the old Westcombe Park police station which are even closer to the A102. Why knowingly and intentionally put people in harms way i.e. pollution? So, close the windows. Pretend its not there. Live in an air conditioned box? I will use my favourite word of the moment – greed! This and the flats at the bottom of Westcombe Hill will be even better if Blackwall Tunnel 2 is built – double the traffic, double the pollution. Let’s remember that Greenwich refused the scheme. It was the Planning Inspectorate that allowed it on appeal BUT if you read the inspector’s report he is very critical of the council for failing to supply evidence to support its own case for refusal. Makes you wonder how committed Greenwich is once something goes to appeal. It looks like the site is being cleared at the moment, so perhaps construction is imminent.